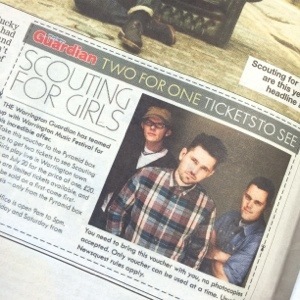 Guardian offer 2 for 1 Scouting For Girls Tickets! THE Warrington Guardian has teamed up with Warrington Music Festival for this incredible offer. Take a voucher from today’s Warrington Guardian to the Pyramid box office to get two tickets to see Scouting for Girls play live in Warrington town centre on July 20 for the price of one, £20. There are limited tickets available, and they will be sold on a first-come first-served basis – only from the Pyramid box office. The box office is open 9am to 5pm, Monday to Friday and Saturday from 10am until 2pm. You need to bring the voucher with you, no photocopies accepted. Only one voucher can be used at a time. Usual Newsquest rules apply. Previous Post In the studio with The Roughneck Riot..